"I am a punkahwala; come to repair the fan!" It was the hour when man, bird and beast were still, wrapped in sleep. Everything had melted in the thick darkness. The train was speeding along like a spangled snake, along the Sub - Himalayan jungle track. Dr. R turned in bed and opened his eyes, for there was a strange smell in the compartment, something burning, he thought! The fan was emitting sparks, like a Catherine Wheel! There was no one else in the coach, except his wife who was fast asleep. There was no time even to think out a plan. He put out his hand and fumbled with the switch, but, good God, it was out of order! The fan could not be stopped. It had to burn like that! ……. and perhaps, set the compartment on fire! Pull the alarm chain? But, that will be a big sensation; it would involve delay, for the guard has to investigate, come, diagnose, prescribe, administer the treatment etc. The sparks increased ; the smell smote the nose. "Baba! O Baba, save us, O Baba!" 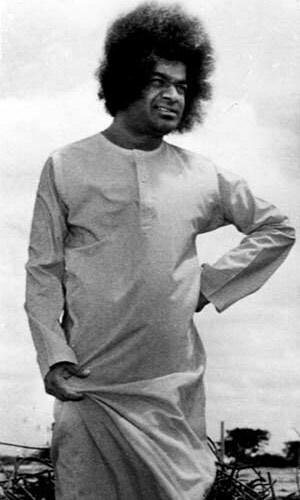 The prayer automatically rose from his heart, for Bhagavan Sri Sathya Sai Baba was his never failing succour. The train slowed down just a wee bit. Was it a station they were coming to? Well then, when it halted, he could wake the wife and both could get down and tell the guard. He rose and peeped into the darkness, far out into the oncoming stage. Suddenly he saw a man clinging to his door holding fast to the handle. How could have possibly hopped up the running train in that forest blackness? A nascent fire, a sneaking thief -what was he to do? The man said, "I am a punkahwala; come to repair the fan!" He looked a seasoned mechanic; he had a screw driver in his hand; he wore a kakhi shirt and drawers; he smiled in an appealing way. So, the doctor opened the door and let him in. The train gained speed. The wife too woke. It was all so easy for his skilfull hands; a few turns of the screw and tap or two at the proper place; the sparks ceased , the fan whirred, swift and safe. He was a silent, skilful hand. He then sat crouching in a corner and asked the doctor to lie down and sleep. His voice was so sweet, his kindness was so overpowering that the doctor lost all fear and suspicion. He laid himself down and turned away from him and dozed. But, the wife had her own fears. She had read and heard of robberies in running trains of even worst calamities and so, she had half an eye open to watch the stranger's slightest movement. And, even while her eye was watching him, he disappeared!! A week later, they get a letter from Baba at Puttaparthi, "How did you like my Punkah repair?" Dr. R. himself narrated this wonderful incident when he came for Mahasivarathri to Puttaparthi. "This is My Duty; when a call comes out of distress and devotion, I hasten to the rescue", Baba said. And sure enough, Baba kept His word!